"Reaching Out" - my Forever Project™ top is finished! YES! the top is finally done. Borders and everything!. My own "rule" for Forever Projects™ is that they are handwork and done only when I am away from my house .. doctor's appointments, Little League games, road trips, vacations. I don't work on them at home because when I'm at home, I using my sewing machine to work other projects. But, because I was just a tad paranoid that I had underestimated the border fabric (and the store only had a little more AND it wasn't even a local store for me), I plunked my rear end down in a chair and stitched away until I was done, *done*, DONE! All of the hexie flowers were hand-stitched. All of the applique was hand done. 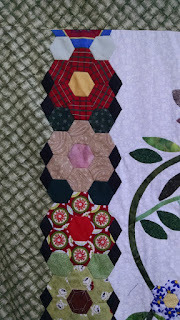 The borders that connect to the hexie flowers (the sides) were hand stitched/appliqued but the top/bottom borders, which were straight lines, were machine stitched on. I wanted to be able to have all of the applique pieces "complete" before I ever stitched them to the base fabric. This is because, if left to my typical practices, I will keep picking ONE color and then I'd have a concentration of THAT color in ONE spot rather than it being scattered all over the top. In order to have that apparent random scattering of color, for me, it would be best if all the applique shapes were prepped before hand. To do that, I used a fusible, water-soluable stabilizer as my applique template. These come in sheets that can be fed through your ink jet printer. So, I scanned all the applique shapes, put them into a graphic and then *printed* the applique shapes onto the water-soluable sheet. Afterwards, I cut the template shapes out, fused them to the wrong side of the appropriate fabric and used a washable glue stick to adhere the seam allowance to the back of the template. THEN, I could plop the appliques wherever I wanted and rearrange them easily before stitching them to the base fabric. I also used a swipe of washable glue to stick the applique to the base fabric, instead of using pins .. because I just do not like getting stuck with pins when I am sewing! The jagged sides of the hexie flower columns were hand stitched to the appropriate base fabric (the border print or the white background fabric), while the straight line of the top & bottom borders were machine stitched. Obviously, you can't tell the difference from a casual look, but *I* know just how much hand work went into it! I didn't even TRY to match the pattern of the border lattice print! While all the borders were cut with straight of grain, the sides were oriented vertically and the top/bottom borders were oriented sideways. There is simply *no way* you can match up printed fabric when they are placed 90° to each other. My current Forever Project™ has the end in sight! 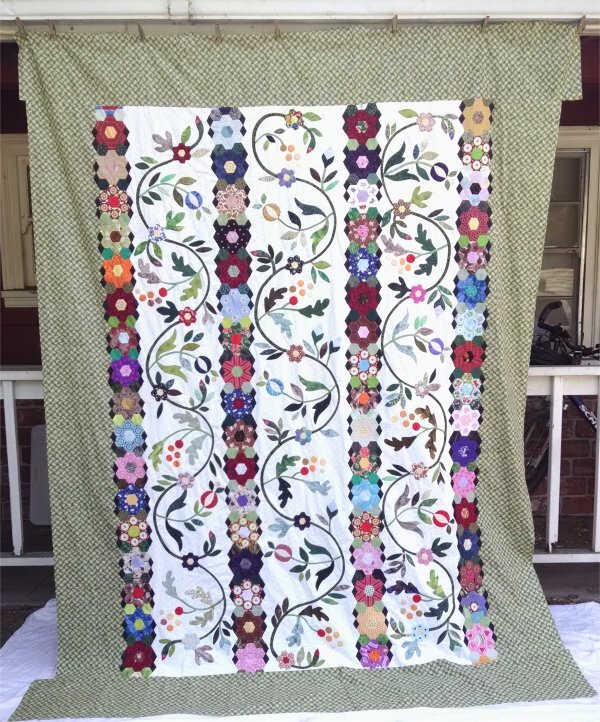 This layout alternates columns of hexie flowers with columns of vines & floral appliques all surrounded by a slab-o-border. I've been working on this hand-stitched project since .. well .. Forever. (Actually April 2015). 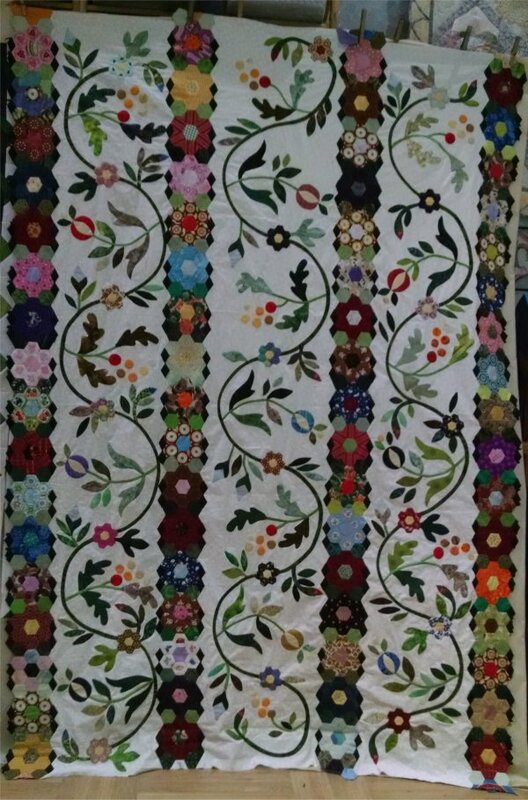 I recently finished stitching all the panels (columns) together, since all the applique work was FINALLY done. Oh, woo hooo ... I tell you, I am rather tired of those flowers and leaves. I've been worrying about what to do about the border. Generally speaking, I don't care for slab-o-borders but in this case, I think that is exactly what the layout calls for. 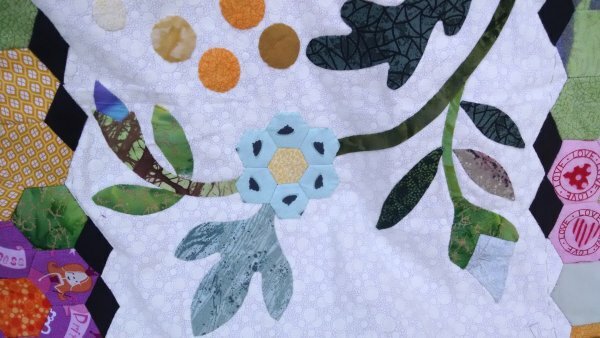 Any pieced or appliqued border would be just way too much when combined with the "busy-ness" of the interior. 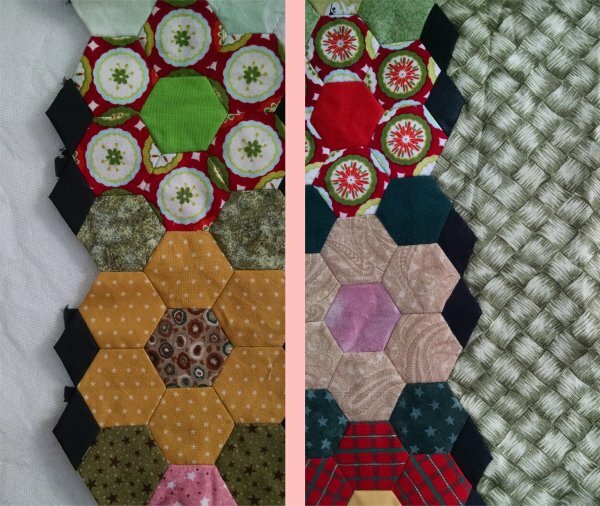 When I was on a recent vacation, I hauled my Forever Project™ in to a local quilt store. I was quite gratified when my applique column was ooooh'd and ahhhh'd over. :-) The employee, Lindy, helped me audition various fabrics, after I explained what I was .. and was not .. looking for. I even entertained the notion that I wouldn't find anything. So, it was with some surprise that I discovered a basketweave/lattice print that worked very nicely with the floral appliques and hexie flowers. We calculated what we thought was a reasonable/correct amount for the border ... and I added on another half yard. 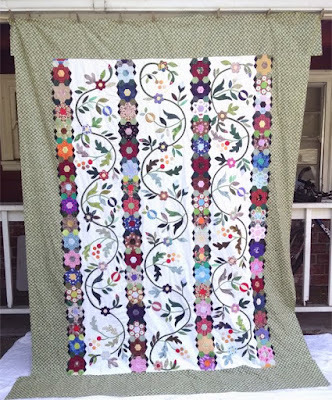 Being that I was on vacation, this particular quilt store was nowhere near my usual haunts and I knew if I had miscalculated and ran short of this print, I would be hard-pressed to find it locally. So, after the last stitch was fastened off, which connected the last columns together, I took a HUGE breath and cut my borders. And hallelujah!! I will have enough. Whew! To be sure, there is more appliquing to be done .. as that is how I am going to attach the columns to the borders ... but ya know? .... IT'S ALMOST DONE!!! woo hoo!